The Dark Knight is the best night! Hollywood has made another comic to movie flick, DC Comics have released another film and there is but one question? 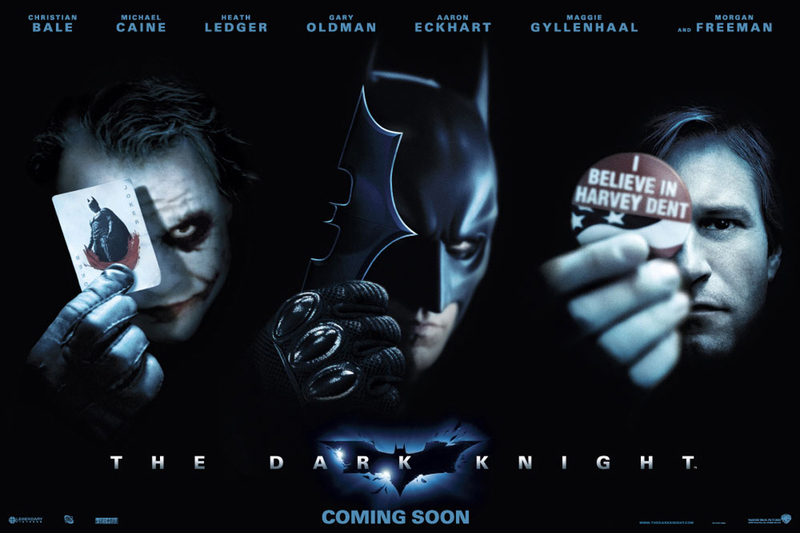 Is The Dark Knight the best Comic to Movie film made to date? Myself and a few others saw The Dark Knight on Sunday. Included in the group were 2 comic fanboys (yes, me and IEKenner), 1 ex-comic fanboy and 2 joe publics. So since critics said these things, we expected the movie to be absolute crap. Heath Ledger‘s performance as the Joker is the most anticipated and talked about role ever. Was it worth the hype? Sorry Jack Nicholson your crown has been stolen. Heath’s portrayal of the Joker was sublime. The insanity and madness shone through, the manically murderous traits were clear, overall, I can definately see why the are saying it is an Oscar performance. Christain Bale is was again a great Batman and after this one, has removed Michael Keaton as my fav Batman. YES! No bloody Katie Holmes! Maggie Gyllenhaal is great as Rachel Dawes, bringing real character to the role. Aaron Eckhart as Harvey Dent played a great role in the story telling. And then as Two Face! Damn! Michael Caine, Morgan Freeman and Gary Oldman returned again playing the roles brilliantly. Specially Gary Oldman. As James Gordon he brought the realness and ‘human’ touch to flick. So strong a performance. Now, how about this guy, Christopher Nolan? what, he has done how many movies now? 7…yes just 7 as a director. But he knows what he is doing. The film flows seamlessly, the character driven plot was beautifully mixed with action, surprise and wonderful effects. I think when the Joker did his magic trick with the pencil, it just summed up the film. Expect nothing, everything and the unexpected. Yes it is a long film at 152mins but you will be enthralled by the cinematography, the soundtrack (no surprise it had Hans Zimmer behind it) and the great storyline let alone the brilliant acting. What was so great to see was a comic sequel that was not driven by explosions, an overload of new characters and stupid gimmicks. This film was just such a pleasure to see. This is the best comic movie to date and even if you don’t like comics, you must see this film.